Previously we covered moving off on a motorcycle, braking techniques and the blind spot. You will of course need to understand how to safely and smoothly pull over and stop on your motorcycle. Safe stopping procedures will be covered during CBT and during the mod 2 motorcycle test, the examiner will ask you to pull over to the left-side of the road on a few occasions. Among various reasons, one reason will simply be to ensure that you pull over safely, so that you do not endanger yourself, other road users or pedestrians and that it is performed smoothly and under good control. Let’s start with the safety procedures. You must be aware of what traffic is in front, to the sides and behind. Before slowing down to pull over, it’s essential to check your mirrors. If there is a vehicle traveling close behind you, easing off the throttle or braking may result in a collision where the driver of the vehicle behind does not anticipate your slowing. If you do see a vehicle traveling too close behind, you can reduce speed at a much slower rate to provide more time for the driver at the rear to react and possibly provide an arm signal as an extra visual aid to your indicators to confirm your intentions. Sometimes checking only the mirrors may not be enough. It could be that there’s a lot going on around you and the road is busy. But whatever the reason, if you are not completely confident in what’s going on behind you after checking your mirrors, take a quick glance over your right shoulder. Why check over your right shoulder? 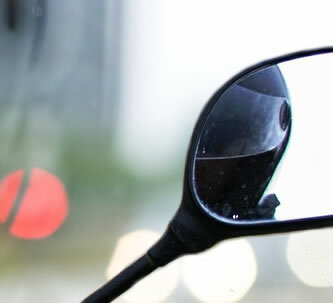 If you have read the motorcycle blind spot tutorial, you may know that some areas to the rear and sides are not covered in mirrors. These blind spots can obscure another motorcyclist or a small car. Before slowing down to pull over, a simple glance over the right shoulder can be enough to save your life. Only signal to the left when you have confirmed that it’s safe to do so by checking mirrors and shoulder check. It’s not compulsory to signal when pulling over and stopping, it’s only necessary when it may benefit other road users or pedestrians. However, as a matter of habit, you may signal regardless of the benefits to others if you wish to do so. Failing to indicate when it’s of benefit to others can be dangerous and inconvenient to others and can fail a practical riding test. Once the motorcycle has stopped, lean away from the road by placing your left foot on the ground to support the weight of the bike. Now apply the front brake and for extra support, place your right foot onto the ground. With the front brake and clutch lever still pulled in, use your left foot to select neutral, release the clutch lever and place both feet onto the ground.